A powerful and unique feature of Caché is its unique Unified Data Architecture that provides simultaneous, high-performance object and relational access to data stored within Caché. Within Caché, you can model your application components as objects. Objects are organized by classes which define the data (properties) and behavior (methods) of the object. The meta-information, or definition, of each class is stored within a common repository referred to as the Caché class dictionary. The class dictionary is itself an object database, stored within Caché, whose contents can be accessed using objects. The class dictionary, by means of a class compiler, defines the storage structure needed by persistent objects and converts class definitions into parallel sets of executable code that provide both the object and relational access to this storage structure. By means of this architecture, the object and relational code paths are efficient and automatically synchronized with one another. Interactively, using the Studio development environment. Relationally, using DDL. Caché accepts standard SQL DDL statements and automatically creates corresponding class and table definitions. Textually, using XML. Caché supports an external, XML representation of class definitions. Typically this is used for source code management, deployment, automatic code generation, and interoperation with other tools. Programmatically, using objects. Using the Caché set of class definition objects, you can create programs that communicate directly with the class dictionary and create new classes at application runtime. Using an XML Schema Wizard, included within Studio, that can create class definitions from most XML schema files. 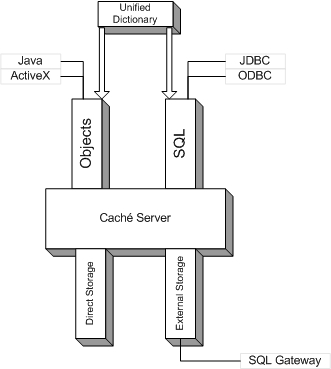 The Caché object model differs from those of programming languages in that in addition to properties and methods, you can specify storage-related behavior such as indices, constraints, and storage structure. The storage structure used by persistent objects is independent of the logical definition of a class and is quite flexible: developers can use the default structures provided by the class compiler or they can tune the structures for specific cases. Object persistence  Persistent objects have the ability to automatically store and retrieve themselves to a database. The persistence support includes complete database functionality including automatic transaction management, concurrency control, index maintenance, and data validation. Persistent objects are automatically visible through SQL queries. The Caché object functionality is not a separate part of Caché; it is a central part of Caché programming and is fully integrated with relational access described elsewhere. However, for those who are interested specifically in object-oriented programming, the manual Using Caché Objects discusses Caché programming from this point of view. The simplest and most common way to define classes within Caché is to use the Studio development environment. The Studio lets you define classes either using a simple text format within a syntax-coloring editor or by using a graphical point-and-click interface. These two views are interchangeable and are automatically synchronized. This class is defined as a persistent class (that is, it can store itself within a database). In this case, the Caché-provided, %Persistent class (system class names start with a % character to distinguish them from application classes) provides all the needed persistence code via inheritance. The class belongs to the package, MyApp. Packages group related classes together and greatly simplify development of large applications. The class defines two properties: TheName, which has a string value, and TheValue, which has an integer value. Support for streams (known in SQL as Binary Large Objects, or BLOBS). Support for stored procedures (implemented as object methods). A set of object-based extensions. Support for Transactional Bitmap Indices. Bitmap indices, typically used in large data warehousing and OLAP systems, offer the ability to perform high-speed searches based on complex combinations of conditions. Such bitmap indices cannot be updated in real-time, however and are typically updated as a batch process. Caché SQL supports bitmap indices that offer high-performance searching power combined with no loss in insert/update performance. This gives transaction processing applications the ability to perform data warehouse-style queries and gives data warehouse applications the ability to perform real-time updates. For more information, refer to the Bitmap Indices content in the Caché SQL Optimization Guide. When Caché loads SQL DDL (Data Definition Language) statements, it uses the inverse of this projection to create classes that correspond to relational tables. The Person class gets its persistent behavior from the %Persistent superclass provided with Caché. The Name property is defined as a simple String of up to 100 characters. The Address class is derived from the %SerialObject superclass. This class provides the ability to serialize itself (convert itself to a single-string representation) and embed itself within another containing class (as with the Person class). Note that the object identifier is visible as a column. In addition, the fields of the embedded Address object are projected as separate fields. These fields are given the synthetic names Home_City and Home_State and behave exactly as if they were defined as two individual fields. This new class extends the Person class by adding an additional property, Salary. In this case, we see that all the rows are returned because every Employee is defined to be an instance of Person. In this case, however, only the properties defined by Person are displayed.